A twice-monthly pairing of book covers that just seem to go together. Click on either of these images to open up an enlargement. 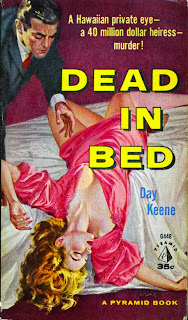 One doesn’t usually think of bed as a place where murder awaits, but these two paperback covers tell quite a different story. 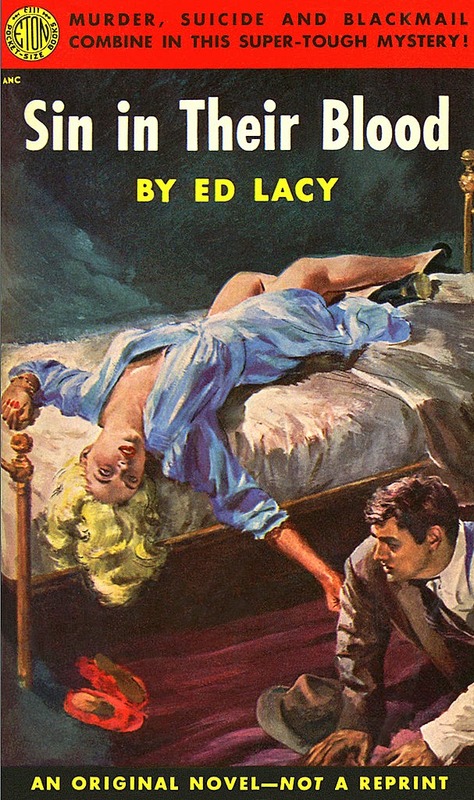 The image on the left, from Dead in Bed (1959)--the first of two novels written by Day Keene (aka Gunnar Hjerstedt) and featuring his half-Irish, half-Hawaiian Los Angeles private eye, Johnny Aloha--displays on its front a splendid painting by the once-prominent Harry Schaare. This Pyramid edition of Dead in Bed is one I’ve been hoping to add to my collection for some while, but I have yet to locate an affordable copy. I found a clean, high-quality one in the booksellers room at the 2011 Bouchercon in St. Louis, Missouri, but it was priced at $40, which seemed awfully steep for a book that could originally be had for 35 cents. Even copies from AbeBooks run $29 and up. Someday, though, I’ll snag a more reasonably priced copy of Dead in Bed and never let it go. 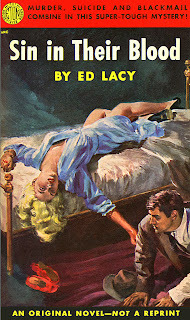 Lacy was also the creator of African-American sleuth Toussaint Marcus Moore, who made his debut in the 1957 novel Room to Swing. I haven’t found any information on who painted the Eton cover for Sin in Their Blood. If any readers out there can fill in that significant detail, I’d be most appreciative. READ MORE: “Dead in Bed (Day Keene, 1959),” by Jure P. (Alpha-60 Books); “Panic in the Sheets,” by J. Kingston Pierce (Killer Covers). OK, Karen, I have added an easy e-mail subscription mechanism in the right-hand column of this page. And I entered your e-mail address to subscribe. You should soon receive a confirmation note. I hope everything works out to your satisfaction. Thanks for reading Killer Covers.